After the Spurs gave away the lead in the third quarter, they came back strong and beat the Thunder easily with defense and Kawhi Leonard scoring at will. In the third quarter, this game felt a whole lot like the last two games, as the Spurs were passive and careless with the ball, and let the Thunder get back into a game where they had been dominated early. But late in the game the Spurs remembered who they are—a great defensive team led by an individual named Kawhi Leonard who can score on anyone. Those two facts came to the forefront as the Silver and Black dominated the Thunder in the fourth quarter and won easily, extending their record to 37-11 and starting a new win streak of one game. The Spurs started a big lineup with Dewayne Dedmon and LaMarcus Aldridge in the frontcourt with Kawhi Leonard and a backcourt of Danny Green and Tony Parker. The game started with the guys in Silver and Black offense looking almost as stagnant as it had in the second half of the Mavs game on Tuesday, but the defense was more energetic, and they kept the pressure up on the Thunder. The game was pretty even halfway through the quarter, but the relentless pressure got to the Thunder and the Spurs ran away at the end on an 11-0 run to finish the quarter fueled by Thunder turnovers which led to wide open shots for the Spurs to lead to lead 31-17 after one. The Spurs kept up the pressure on defense as the second quarter started, but they couldn’t do much of anything on offense. Halfway through the quarter, they had only allowed OKC to score 4 points, but they had only scored 8 themselves. Lamarcus and Tony had to leave the game with foul trouble, and it was time for the Juice Unit. Westbrook, who had been held in check until then, started to take over the game for the Thunder, and was able to erode the lead to just 8 late in the quarter. A furious dunk from Domantas Sabonis finished up the scoring, as Jonathon Simmons’ putback dunk at the buzzer was just a fraction of a second late and the Spurs led 52-42 at the half. The second half started with Aldridge making up for his lackluster play in the first half with hot shooting, scoring 9 of the Spurs’ first 12 points in the third. Russ Westbook was having nothing of it, though as he got free to sink a couple of deep threes to keep the game from getting out of hand. Imposing his will, the Thunder brought the lead back to single digits again. The Spurs lead was just a single point as Oladipo sunk a three with four minutes left, and then Westbrook put them ahead with a layup. The Thunder’s 9-0 run had them ahead 71-68 with a little under 4 minutes left in the quarter. A midrange jumper from Kawhi stopped the bleeding. The Spurs picked up their aggression a little bit as the quarter came to a close, and a Patty Mills two for one and a Kawhi hoop plus harm put the Spurs up 79-75 with seven seconds left. Somehow, the Spurs avoided a Thunder score at the end of the quarter and that’s how it ended after three. 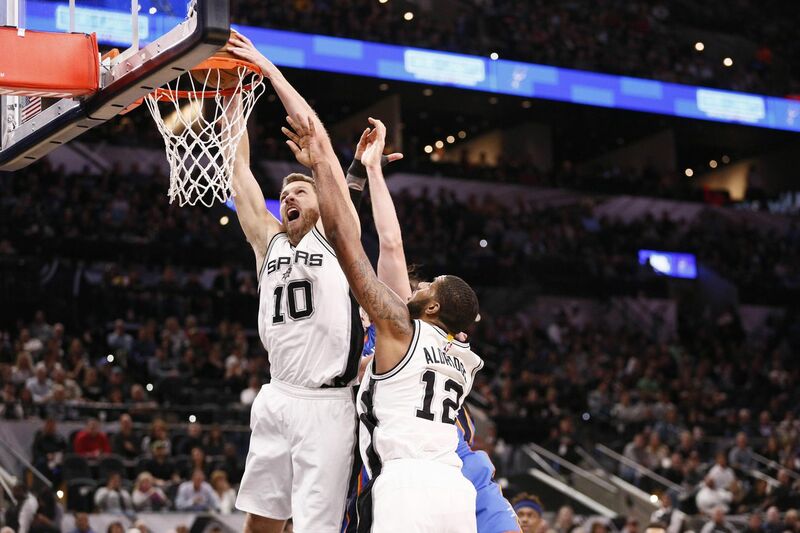 After another crappy third, the Spurs found their identity and after a spectacular chasedown block to negate a Thunder fast break, the Spurs looked like they were in control. Westbrook had been resting, but the Spurs had refound their energy and Leonard began to take over. The Thunder were helpless against Kawhi’s fury as he took over the game and dominated any defender who tried to cover him. Sabonis did what he could to try to bring the Thunder back with deep shots, but it wasn’t enough. The Spurs won 108-94. The Spurs started the game with the same stagnant offense the had played in the second half of the Mavs game, but much better defense. David Lee is pretty tough. He got popped pretty hard in the face in the second quarter and got back up and made a basket with blood dripping from his mouth. The Thunder really miss Enes Kanter, who has the most embarrassing injury since Amar’e Stoudamire punched a fire extinguisher. The Spurs forced just 7 turnovers against the Mavs in the entire game. In the first half tonight, they took the ball from the Thunder 13 times. In the third quarter, the Thunder were the more agressive team, and the Spurs looked out of sorts and disorganized. The team with more energy and agression always is rewarded. Oh no, it wasn’t the airplanes. It was defense that killed the beast. There was a weird call in the fourth where they rescinded a techical foul shot by Kawhi because he had not been on the floor when the tech was called. Patty took the shot. I have never seen that before. Dejounte Murray didn’t get into the game until garbage time. He needs more minutes to develop this year. The Philadelphia 76ers come to the AT&T center on Thursday for a game at 7:30 pm. It’ll be a chance to see Joel Embiid, who was inexplicably not selected to play in this year’s All Star game. Strike that … Embiid is injured, so we won’t get a chance to see him play against the Spurs until the Rodeo Road Trip. They’re still an exciting team to watch with a lot of talented young players, and the way the Spurs have been playing at home lately, it’s not a game to be taken for granted.